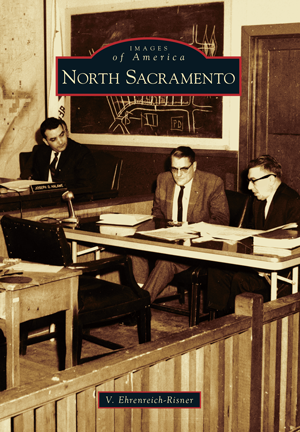 In 1910, the North Sacramento Land Company purchased 3,339 acres to establish the city of North Sacramento. Three years later, Del Paso and Company set up power and water operations, along with rail transport. A police and fire department and school sealed the deal, and the city incorporated on June 18, 1924. In this idyllic hometown, parents allowed their kids to walk "the Boulevard" unattended, skate at Iceland, and cool off in Woodlake Pool, after they stopped in at Li'l Joe's or Sammy's for a bite or a donut at Hoyt's. The city thrived with characters like Mama Marks, Mayor Olga Roth, and entrepreneur Betty "Boop" Bryan. Pugilist Max Baer sparred in the open-air theater before the screen came down to the sawdust floor for a Tom Mix movie. V. Ehrenreich-Risner, a librarian at California State University, Sacramento, and public history doctoral student at the University of California, Santa Barbara, utilized photographs from the Sacramento Public Library, North Sacramento School District, Sacramento Archives and Museum Collection Center, and North Sacramento families to assemble this stirring volume of vintage imagery. Together these images form a snapshot of North Sacramento's early times, when gypsies camped along Arcade Creek and a thriving, self-contained downtown along Del Paso Boulevard fulfilled its citizens' every need.